Fantastic perfect day . Very informative and friendly commentary from extremely knowledgeable David and gorgeous colourful scenery. i absolutely recommend this tour and extra good on a beautiful fine sunny day like we had when the sea is stunning, in shades of blue and green and the sun giving maximum effect of the deepness of the orange lichen colour on the rocks in the Bay of Fires..This is one of the best Australian day trips I have ever done and I have traveled a lot in Australia. I loved the walk along the sand we did too and I liked the wonderful impressive carvings in the top of the trees in Ledgerwood on the way. Don't miss this amazing tour! ! Many thanks David for a super time. Excellent guide who knows a lot and willing to share his knowledge. Fantastic tour of the lavender farm, rainforest, oyster farm, bays of fire, Sheffield. Awesome experience!!! The trip to the Bay Of Fires with Dave was certainly a fantastic day out. It was a very enjoyable and educational outing - there isn't anything that Dave doesn't know about Tasmania! The highlights for me were Binalong Bay and Taylors Beach, which are the most amazing beaches with the whitest sand and sparkling, turquoise water. Beautiful! Highly recommended. The guide was very good and knowledgeable we got a good history lesson about Launceston and its people. and most of the chat was always good and interesting. Our guide David is fantastic who gives us so many background information to appreciate Tasmania in a deeper sense, not just for the sights, but the history. 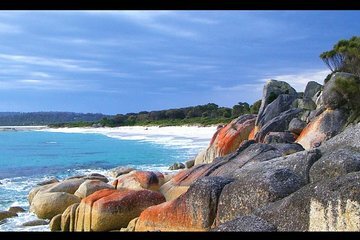 Bay of Fires is a place that you must not miss. So beautiful and refreshing. OK, this is my favourite tour so far. The guide was superb, not just with the info but voice and personality - such a pleasure to listen to! Sights are amazing and every bit the way they look in photos. There is nothing mediocre about this trip, its 5 stars all the way. What a wonderful experience! Dave , our tour guide is so helpful. He is so experienced and knowledgeable. Organised the trip with lots of fun and informations about Launceston. Learned a lot of history about Tasmania. Apart from the amazing bay of fire, we got to visit the rainforest , an absolutely fascinating spot that everyone should go. The free tasting of the big juicy oyster is just the icing on the cake. The hotel pick up and drop off service is great . The vehicle is comfortable. This trip is worth the money and highly recommended to others. Superb tour with the most fantastic tour guide - David from Coach Tours Tasmania! He was the most funny, entertaining and engaging. He used the time on the bus to tell us everything about Tasmania. You must definitely have David as your tour guide! Great Day Trip. Liked everything about it except perhaps the selection of the berry farm. The 3 berry farms I visited in 3 other tours were of higher quality. David was a wonderful Tour Guide with a Google knowledge of Tassie. He was amazing. We were very lucky to see dolphins surf during our walk on the beach. Perfect weather!! A tour guide who was knowledgable and interesting. A small group which allowed us to mingle with everyone.